Lambda Systems is using Green Hills Software�s INTEGRITY RTOS and MULTI integrated development environment to develop its GRID-VEGA video frame-buffer overlay system. Lambda Systems selected Green Hills Software�s solutions to provide real-time performance and powerful debugging capabilities that improve reliability. 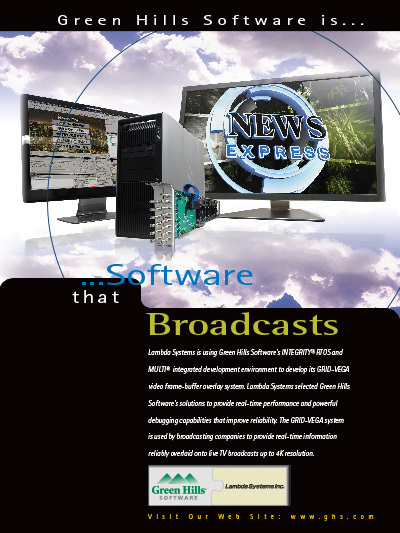 The GRID-VEGA system is used by broadcasting companies to provide real-time information reliably overlaid onto live TV broadcasts up to 4K resolution.